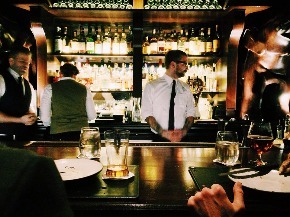 The service industry is a touchy subject for anyone working within it. Sometimes our own friends can irritate us when we’re going out, let alone strangers when we’re working. At least, our friends presumably have some other redeeming qualities, but we get paid to tolerate the drunk strangers, so I guess it evens out. However, I tend to expect people to have some level of common sense. If you’re old enough to drink, you’ve had enough life experience for that to be a fair expectation. But plenty of guests do not meet that low bar, so I’ve learned the hard way to always ask for clarification so as to avoid the dreaded one-star Yelp review. Here’s a few of the questions you should be prepared to ask. This isn’t Hollywood. You can’t just pour “a beer”. You need a brand, preferably one that corresponds to one of the beers you have on tap. Additionally, you need to know what size they want. A pint? Twenty-five ounce? A bottle? I’ve tried staring at guests blankly when they just order “a beer”, but that never works. You’re gonna have to ask. Would you pay $10.95 for just a sandwich? Well, this guy apparently would. All the same, if you don’t ask this question, he might suddenly realize what’s missing. I know, I know, dry martinis do have vermouth in them, but this fact has been muddled by popular culture, people’s understanding of the world “dry”, and the fact that most people are not bartenders. This sort of question goes for all drinks more complicated than a rum and coke. Make sure that they know what they’re getting. You don’t know the cocktail that she had two weeks ago at her cousin’s wedding? Oh, well, not to worry. She’ll use lots of descriptive words here like “sweet” and “bright”. This question almost never leads to you discovering what the cocktail actually was, but it reflects poorly on you if you don’t ask. Look, I get it, people who have children shouldn’t be confined to their house until the kids can watch themselves, but there are some pretty basic guidelines for when kids are allowed in a bar. If your other patrons are concerned that there are children present, then there probably shouldn’t be kids there. They don’t need to see the twenty-first birthday party happening in the corner or hear some old men reminiscing about women before their wives. They especially don’t need to be running rampant. Absolutely do not feel bad for forcing a parent to parent, especially if the kids are damaging the establishment or annoying other guests. If you have to ask, then they need a cab, and you are obligated to call one if they don’t. Too many people have no idea what they’re limit is, which just boggles me when they’re daily drinkers. Regardless of your relationship with the customer, do not let them convince you otherwise. If you have to ask this question, the answer is yes. Alright, this one you don’t have to ask, but insecure men out with their buddies are the only ones that call it a cape cod. Everyone else just says vodka cran. So I just like to make sure they know exactly what’s in the drink. For strictly clarification purposes. Everyone is going to see me pour it anyway. If you’re that insecure about it, just order a beer. Look, ultimately, we chose this industry. For whatever reason. There are certain perks and certain disadvantages to every profession, and this is one of ours. We have to ask some pretty ridiculous questions, but we knew what we were getting into. At least, now you do. Read more from Bartenders and Business. Read more from Highlights of tending bar. Read more from In My Experience.